RIO DE JANEIRO, BRAZIL -- Brazilian marathoner Vanderlei De Lima has lit the cauldron at the Rio Games. De Lima was one of the suspected candidates after Pele revealed earlier Friday that health problems would keep him from attending the opening ceremony at Maracana Stadium. So 12 years later than he likely would have, De Lima got his golden moment. De Lima was leading the 2004 race at the Athens Games when a protester attacked and disrupted his run. De Lima wound up finishing third, but has been lauded for how he's handled the incident. 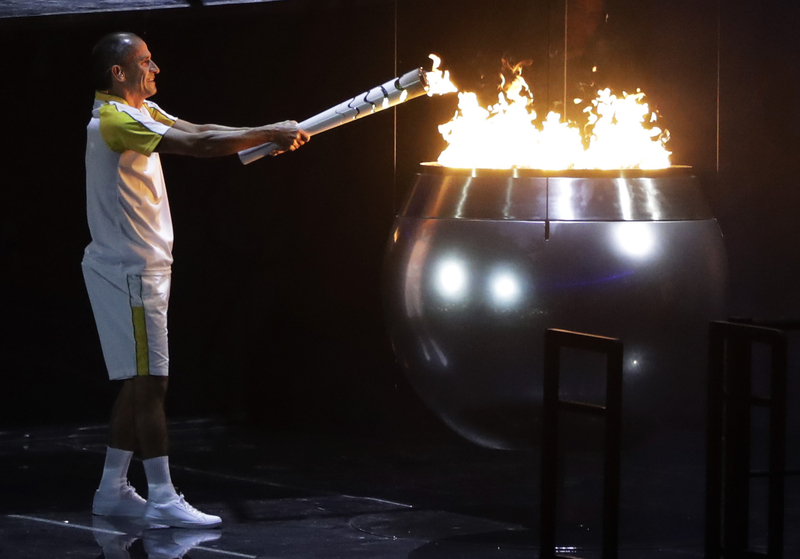 Gustavo Kuerten carried the torch into the stadium, then handed it to Brazilian basketball legend Hortencia Marcari. She brought it to the stage, then De Lima brought it up the stairs and held it aloft for 60,000 to cheer. With that, the cauldron -- one unlike any other in Olympic history -- was lighted. Brazilian officials wanted this cauldron smaller than most, a reminder to reduce global warming caused by fossil fuels and greenhouse gases. The flame is housed in a giant sculpture, with spirals to represent the sun.